Pack up the kids and take the afternoon to go visit a beautiful Iowa garden! There are a lot of gorgeous, fascinating gardens in Iowa. Take part of a day with a garden friend or the family and motor out of town for a great visit. Pack a picnic lunch or stop at a small-town cafe for the perfect, inexpensive mini-getaway. Kelly is also the author of The Iowa Gardener's Travel Guide, a must for any Iowa garden-lover with a car and a valid driver's license. Outside the offices of the corporate headquarters of Better Homes and Gardens in the heart of downtown, lies an urban oasis. It contains 22 garden rooms and beds; 2,500 trees, shrubs, and perennials; 17,000 bulbs; and a changing palette of 500 annuals. The Bickelhaupt Arboretum is a 14-acre outdoor museum of select labeled trees, shrubs, ground covers, perennials and annuals offered to visitors free of charge. Its mission is "to serve as a connection between people and plants through a better understanding of horticulture by developing and maintaining a well-documented collection of plants for education and enjoyment." A short ride down a country road in the heart of Iowa brings you to a living museum of trees, shrubs and native prairie. Walk along grass paths and discover a diversity of 2100 different trees and shrubs representing 486 species, hybrids and cultivars. Bathe in sunlight or keep cool under and leafy canopy as you gaze over vistas of crabapple blossoms, silhouettes in the sunset or fantastic autumn hues. The Arboretum’s master plan was designed by Anthony Tyznik, a botanical artist and landscape architect who designed the Morton Arboretum near Chicago. The design features tree collections in the context of sweeping vistas of native prairie. Most of the tree and shrub collections are grouped by species to allow direct comparisons. The prairie elements include native grasses, including buffalograss, blue grama, little bluestem, and sideoats grama and native wildflowers. The Arboretum includes an ever-expanding collection of more than 2,600 trees and shrubs representing 468 species, hybrids and cultivars. Nestled in the heart of Clear Lake on the site of a former school, this 2.75-acre public garden is home to 22 small theme gardens, two beautiful lawns, and a gorgeous ceremonial arch and pavillion. Lovely water features, well-maintained beds, and beautiful little bridges make for a wonderful stroll. Free admission and handicapped/stroller accessible. Make time to walk through Clear Lake’s charming downtown and walk (or bike) along the lake. Considered one of the best conifer gardens in Iowa. This private garden is available for tours on a by-appointment basis. 319-283-3050 or franmara@mchsi.com. The Greater Des Moines Botanical Garden is one of the most popular cultural attractions in Iowa, providing educational, recreational, and community resources to thousands. Besides its famous "dome" housing a tropical paradise, complete with waterfall, it has other display gardens indoors and out. It is located on 14 acres along the east bank of the Des Moines River, close to downtown. Newly developed paths along the river make for a great walk. The Gardens have limited hours and access through August of 2013 as the Des Moines Botanical Center is transformed. After years of being undercapitalized, community leaders have developed a new business model and an exciting master plan for what will be called the Greater Des Moines Botanical Garden. The Botanical Garden’s programs and gardens will be focused on the new mission of “Exploring, explaining and celebrating the world of plants.” The Garden will be an urban and cultural oasis for the community, fully operated as a 501(c)3 privately governed, not-for-profit institution. Click here for information about the master plan scheduled to be completed in Spring of 2014. A visit to the Iowa Arboretum's 378-acre facility located in scenic, rural Boone County is an experience you won't want to miss. This site offers 40 acres developed as a "Library of Living Plants" showcasing hundreds of species of trees, shrubs and flowers in a tranquil scenic setting. The Iowa Arboretum displays the largest and most diverse display of plants that can be successfully grown in Iowa. A wonderful place to take a long, beautiful walk! For a limited time the Arboretum is offering free group tours of its grounds if you become a member. Click here for details. The Prairie Pedlar sprouted as a backyard business in 1985, growing in every direction for more than a decade. In the mid-1990s, an extensive relocation project began by securing an adjoining seven-acre farmstead and transforming the tumble-down property into a country garden retreat. A Sears & Roebuck barn and a country schoolhouse were rescued and refurbished in an effort to preserve the antiquity of rural Iowa. This unique heritage farm attracts visitors from all over the world. It maintains 20,000 rare vegetables and 2,000 traditional varieties, as well as over 650 varieties of 19th century apples and hardy grapes which are grown at the farm. This farm is also the home of 50 rare, ancient wild White Park cattle. Since its establishment in 1885 these gardens and floral displays have been a tradition at this beautiful 33-acre park. Inviting visitors to stroll from the conservatory to the stone fountain, the park grounds are home to an extensive collection of gardens and trees, including many planted during the early 1890s. 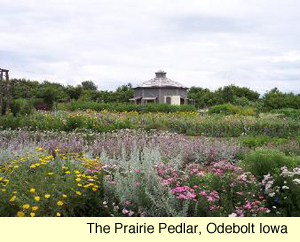 One of Veronica's favorite gardens in Iowa, this meandering collection of primarily perennial beds includes a variety of interesting cultivars not commonly found in other gardens. Willowglen is closing its plants retail business to focus on its garden design work, but wonderful and varied garden will be available for visits on a by-appointment basis.